The New Statesman's cover designer Micha Weidmann has won in the magazine category at the inaugural Just Add Stock design awards. 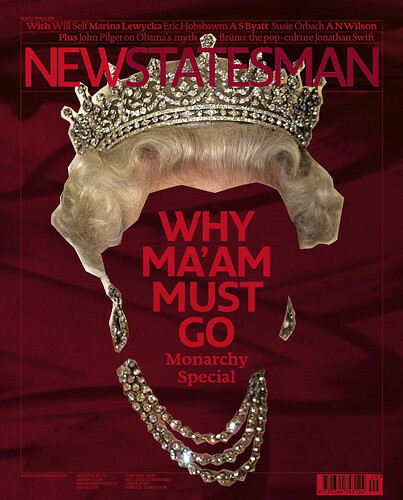 Weidmann won the award for his cover for the New Statesman's anti-monarchy special, 'Why Ma'am Must Go'. In their citation, the judges said they were impressed by the cover's "graphic twist" on a provocative theme. Weidmann was formerly art director of Time Out magazine and now runs a design consultancy based in Spitalfields, East London. The Just Add Stock awards are hosted by Eye magazine and were founded to recognise graphic designers who make creative use of library images. Other winners included Mat Maitland for his collaged cover for Basement Jaxx's Raindrops; Jim Sutherland for his 'Lest We Forget' series of stamps and Penguin's John Hamilton.